It’s that time of year again, Spring cleaning! Not too many people are happy about that, but they probably would like a neater home. Fortunately, if you organize your cleaning tasks, you’ll be able to get them done without tiring yourself out…or redoing them again and again. Who is ready to organize spring cleaning? Below are five steps to get organized so you’ll have a fresh and clean home without the headache! 1. Make a list of all the cleaning you need to do. 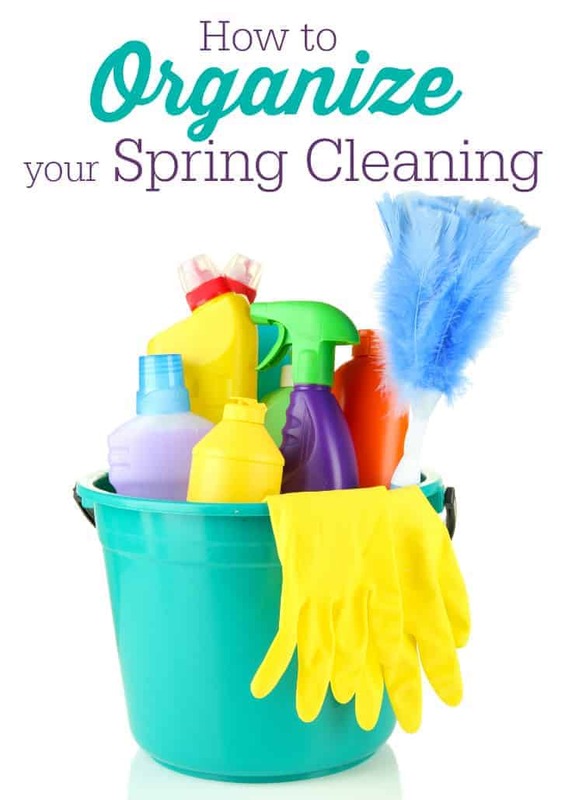 If you’ve recently cleaned after the holidays, every room in your home may not need a deep spring cleaning. Decide what needs to be done in order for your house to be tidy and organized, and focus on these tasks only. 2. Schedule your cleaning to get it all done. Once you have a list of ‘to-dos’ for your spring cleaning, make yourself a schedule. Think about other commitments you have for the next two months, and assign time to straighten up your home around that. One good suggestion is to print off a paper calendar for March, April, and/or May, and be specific with your scheduling. For example, if you have time on April 4th, write in exactly what you are going to tackle, such as declutter the hall closet or clean off the family desk. 3. Create an organized cleaning kit. Having your cleaning supplies in one place makes for a more organized cleaning. Better yet, create a kit that can be carried from room to room so you aren’t wasting time heading back for new products every few minutes. A good cleaning kit needs the basics: window cleaner, all-purpose cleaner, air freshener, rubber gloves, and a couple of clean rags. 4. Designate boxes or bags for the clutter. As you do your spring cleaning, you’ll come across things you need to donate, sell, or trash. Having separate containers for these items keeps you organized. Move the boxes into the room you are working in, so you have them handy when you need to get rid of something. Remove these containers as soon as you finish a room – you don’t want the unwanted items staying in your home any longer than they have to! 5. Continue to straighten as you clean. Just because you are finished with the spring cleaning in the bedrooms doesn’t mean you should forget them! Tidy them up daily so you aren’t having to start over once you’ve finished your list. Plus, keeping things neat lets you know where you left off – so you don’t clean things twice. How do you organize your Spring cleaning? Great tips! I always start my spring cleaning early to get it done before the nice weather arrives and try to work on one room at a time. Great tips! I need to get some serious spring cleaning done! Love these tips Stacie as i really need to start my spring cleaning! Thank you for the tips. I need all the help I can get. But I hate doing windows so I have my husband doing them. The cleaning kit is a great idea- saves trips back and forth for a different cleaning need. Good tips! It’s easy to get overwhelmed with all the work that needs to get done. This makes it a little more manageable. Thanks for these great tips! My house needs a good cleaning after the winter we have had. Not looking forward to it! I am in the beginning stages of spring cleaning and I looked out the window this morning and it was snowing. Kinda ruined my mood for it. How timely, I need to do major spring cleaning, thanks! We don’t really have spring here since we don’t really have winter, so this will be good advice for year round cleaning! Well, I am good at getting the list going! I like the tip about the three boxes as you clean. That will help in getting rid of some of the clutter. I am very excited about Spring being here, but not so excited for spring cleaning. Organize and plan. Set aside a good chunk of time and get supplies ready to have when needed…trash bags included. Then, tackle a corner at a time. Ugh, spring cleaning, oh well it has to be done and then you can be ready to enjoy the nice weather! I could def use these tips this spring!!! Yeah my spring cleaning as you call it falls on Passover for me because we do something called cleaning the Chametz which is cleaning every bit from the house. This is when we all usually do our spring cleaning in the Jewish religion. Might as well your doing the Chametz!! These are all great tips. I think it’s a great idea to go room by room, once I get started I’m on a roll. Thank you for sharing this post. You have some really great tips here. Thanks for taking the time to help me with my spring cleaning! haha. I’m in the middle of it all. I make a weekend of it, then it’s all done. About to tackle my windows, inside and out! Thanks! I need a plan! I hate spring cleaning, so any tips are useful! Thanks. Thank you for the tips. Now it’s getting started doing it. Great advise. Spring has arrived and Spring cleaning is happening at our house. We have donated a couple bags of used clothes to the Diabetes association. Happy Spring! Well you really gave me some good tips that will help when we start our Spring Cleaning. I want to get everything done soon, so we can start enjoying the Spring weather (if it ever comes). I’m trying to be proactive this year. I certainly find setting time aside on my schedule and making a list is one of the best ways for me to get it done. Thanks for the tips. Maybe I am the odd one. I pick a small project year round and do it. This way I am not overwhelmed for Spring. I rather be out enjoying the sunshine. Thank you for extra helping tips!! I needed em! I’m not very organized, even though I try to be. Thank you for the tips, good ideas to keep in mind. Great tips! Need to get started on this! These are great tips! I am the worst at organizing!! I start out all gung ho then move on to another task or room and am like a bumble bee. lol I am going to try it your way 🙂 sounds less stressful!